Jury Eduardovich Danilovsky (the present summary was compiled on August 18, 2014). 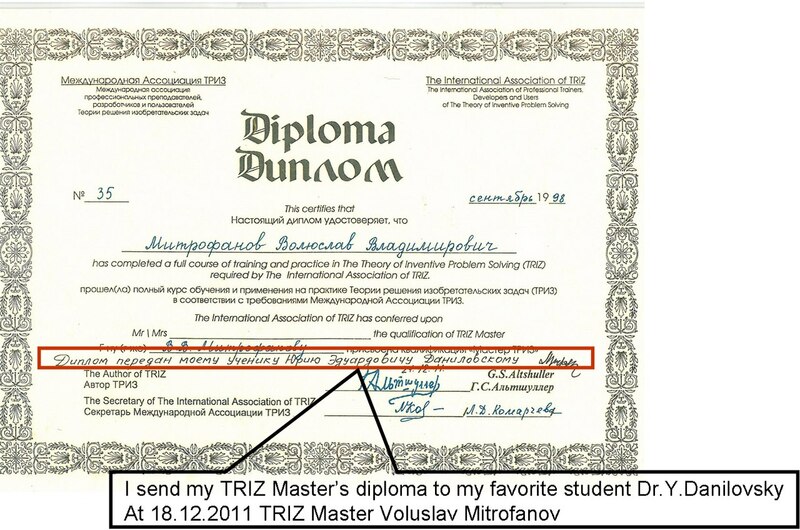 PhD in Engineering (05.23.03 ventilation, smoke removal, air conditioning), TRIZ Master (diploma No. 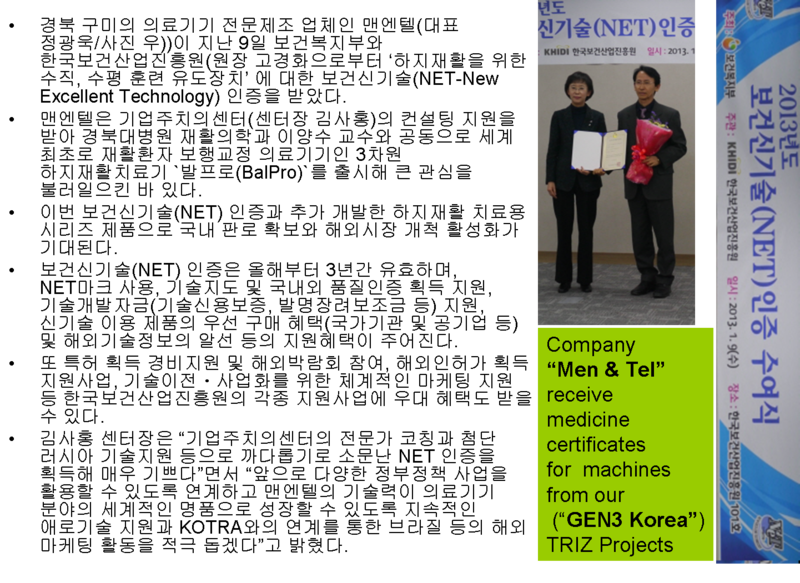 85 – Р), Executor of a number of TRIZ projects fulfilled by the company Gen 3 Korea (South Korea, Seoul). Education. 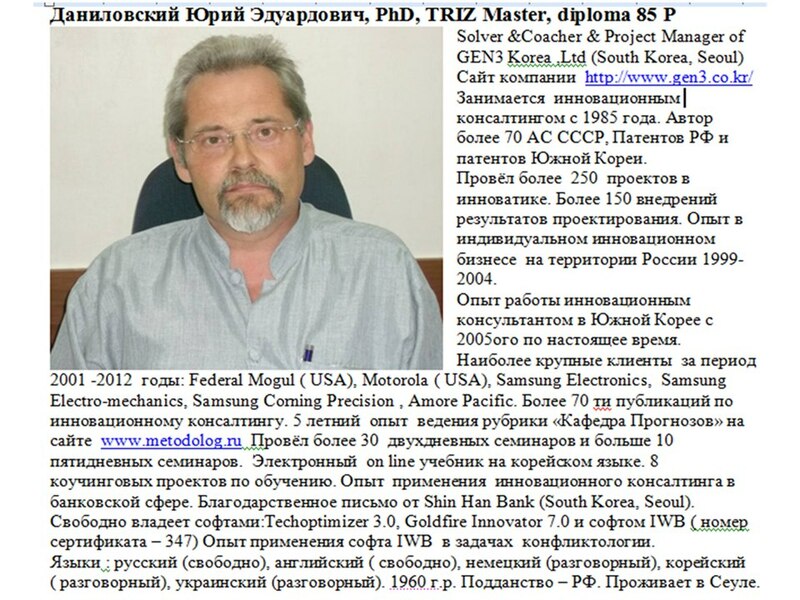 Graduated from the Physical Faculty of A.A.Zhdanov Leningrad state University in 1985, got his PhD degree for the thesis on the topic “Use of nitrogen-based fire extinguishing in specialized fortification edifices” in the Leningrad Military Engineering Construction High School named after the General A.N.Komarovsky in 1992. 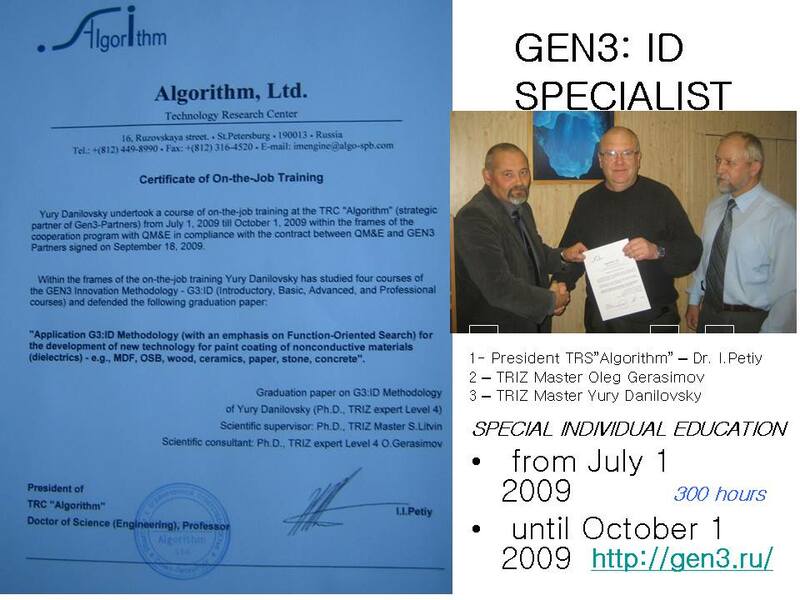 He also graduated with merit from the private, non-governmental university in the field of TRIZ education – MUNTTR (International University of Scientific and Engineering Creativity and Development, Saint-Petersburg), 2000 -2002. 1985-92 Practical experience of work in the field of R&D, creation of prototype units of systems of nitrogen fire extinguishing, smoke removal and smoke destruction system and delivery of these systems to the sites, erection and testing. 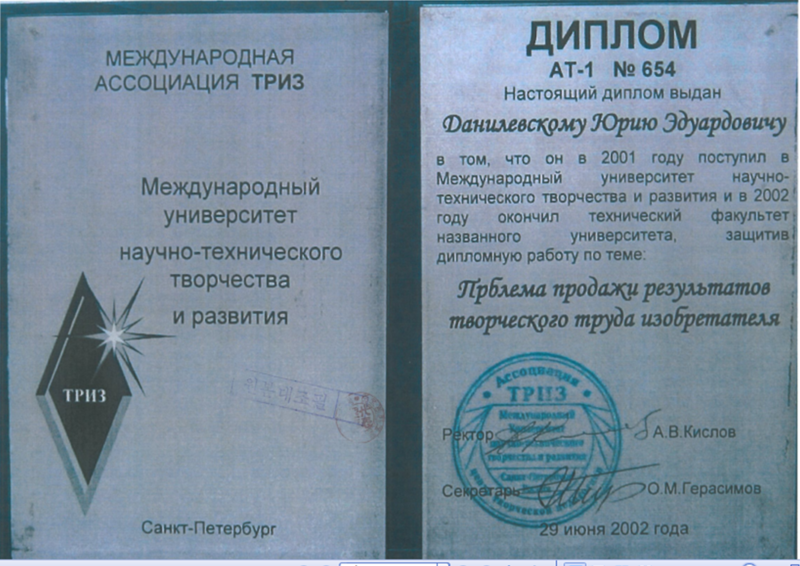 The most important customers are: TUKS MO (Technical Administration for capital construction of the Ministry of Defence of the USSR, Ninth Administration (governmental protection) KGB under the Council of Ministers of the USSR, Organization P.O.Box Р 63-62 , more than 50 author’;s certificates have been issued, no less than 15 inventions have been implemented. 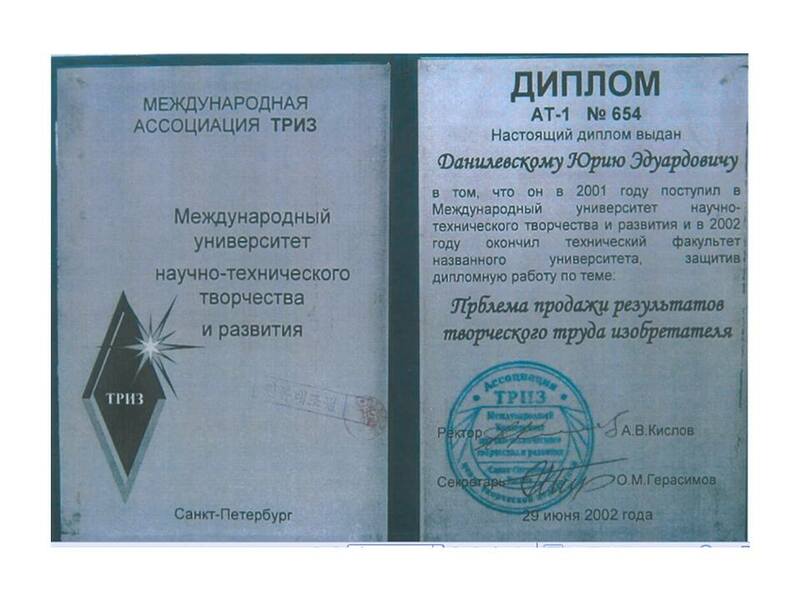 1992-2004 Practical experience of work in the field of innovation business throughout the territory of RF, creation of a private consulting and engineering company, 130 customers, RF patents for engineering activity relating to a system of decorative lighting for landscape design (over 130 projects in 5 years, TV program dated 2002). 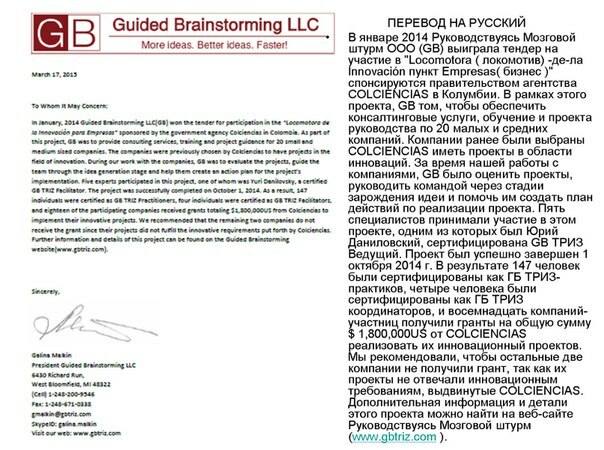 The most important customers of consulting services during this period were Federal Mogul (USA) and Motorola (USA). Mecury vapors sensors, sensors of different gases, vacuum cleaners, air conditioning units, washing machines, conveyor systems, sources of light for computers, systems of defectoscopy of car pistons, systems of measuring pressure in car tires, systems of rehabilitation of patients after a blood stroke (5 projects), system of production of ferromagnetic nano-particles for the diagnostic of cancer illnesses, system of ultrasound liposuction of fat depositions, design of an installation for household growing of wood-lettuce, sputtering technology, molybdenum dust deposition upon the polyethylene film, the problem of dying glasses for mobile phones, the problems of drying glasses for mobile phones, the problem of producing reinforced glass (gorilla glass), system for utilization of food refuse, system for defectoscopy of electric contacts in boards of PC for the braking system of ABC cars. 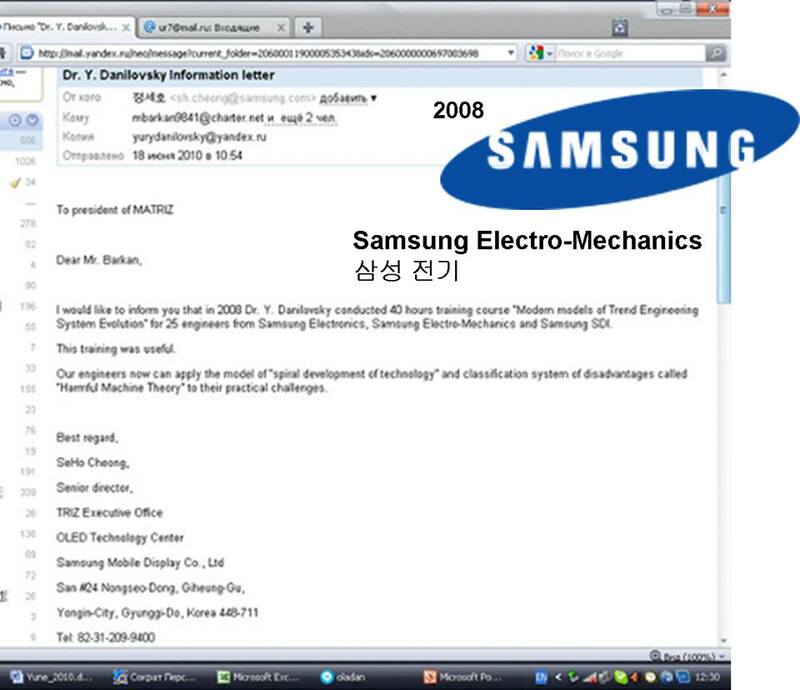 Electronic piano – development of new engineering solutions of a key mechanism and control over the level of sound, medical work associated with care for ageing people (the problem of an ageing society), forecast of solar cells development, new fields of application of electric conducting polyethylene film. 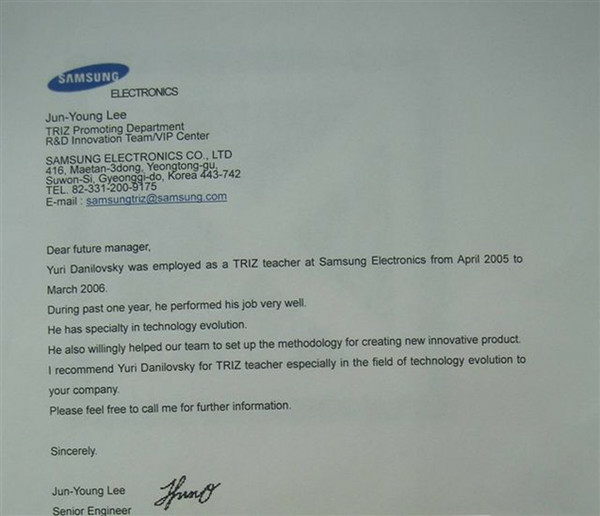 TRIZ in non-engineering skills 8 пprojects for Shin Han Bank, and the use of TRIZ in administrative problems using software GB TRIZ pro– analog of IWB (New Columbian experience), typical themes – increase of sales of accounting systems for the shops pertaining to the network “24 hours”, development of a system for certification of car tires – administrative problems, Ministry of science of Columbia COLCIENCIAS (the National Science and Technology Agency) – system of evaluation of efficiency of employees for promoting them in their career. 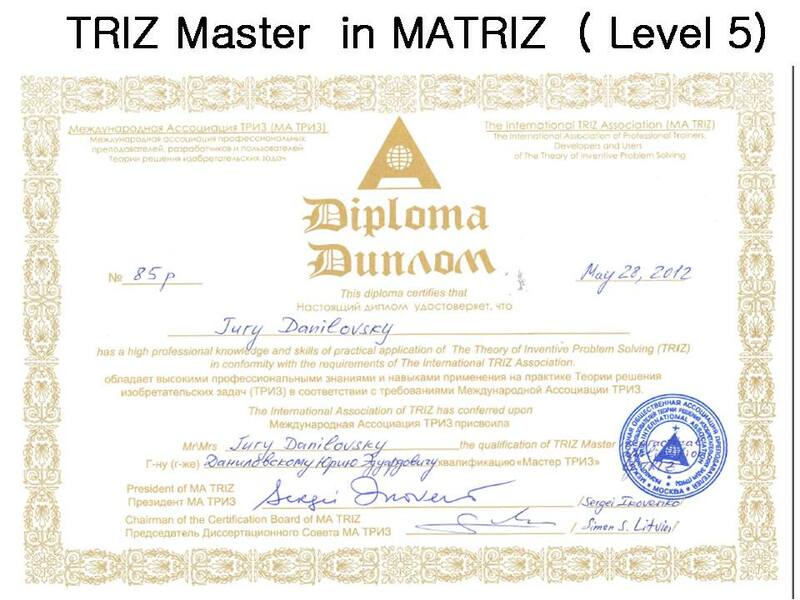 Teaching activities – Since 2002 until the present time I taught practical use of TRIZ to more than 80 groups, offering them the service of different levels of МАTRIZcertification from Level 1 to Level 3, in Russia, Korea, China, Thailand and Columbia. 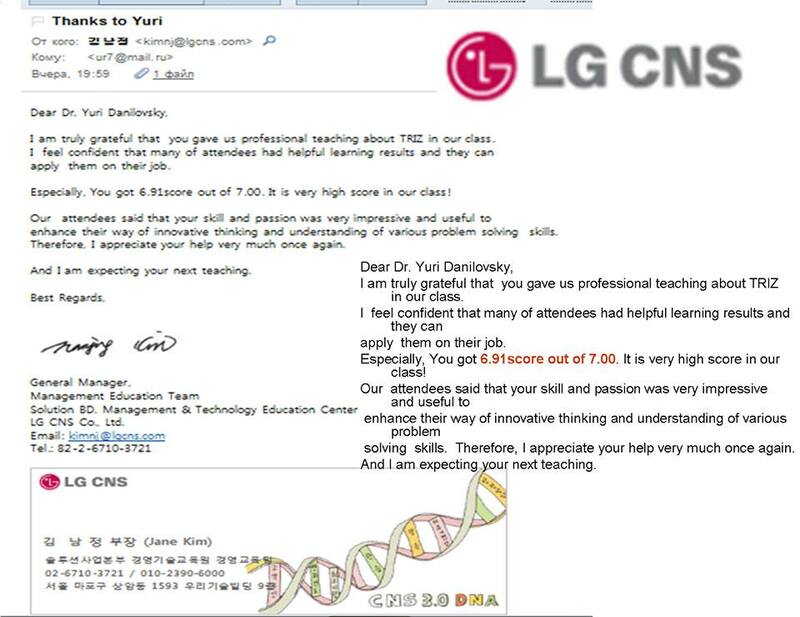 Example: software company LG CNS (customer), quotation from their recommendation letter: Especially, You got 6.91 score out of 7.00. It is very high score in our class! Our attendees said that your skill and passion was very impressive and useful to enhance their way of innovative thinking and understanding of various problem solving skills . 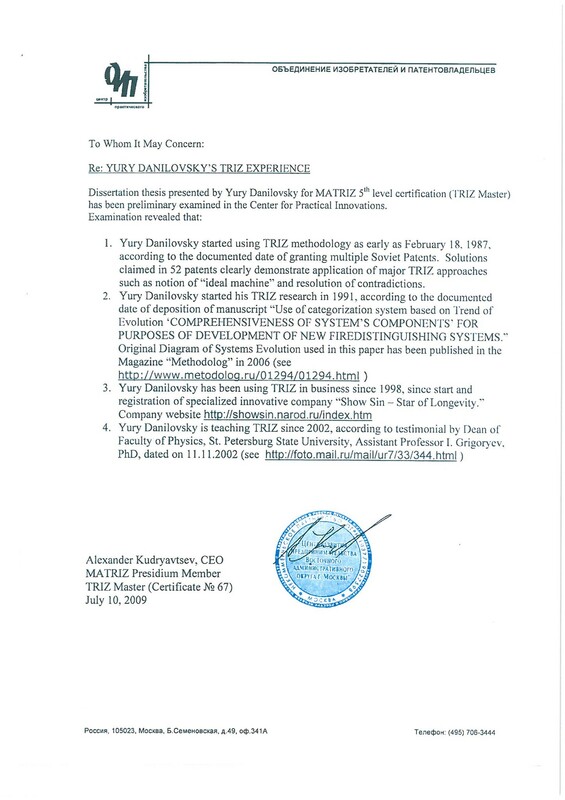 For full text seehttp://triz-solver.com/index.php/o-sajte/227-teacing-of-yury-danilovsky,. Специальные навыки - обходы патентов –порошковая окраска диэлектриков. Система удаления воды в устройствах для копчения, изменение дизайна электрического штекера, изменение дизайна автомобильного хомута, конвейер для склеивания тары, крепление антенны автомобиля, кулер для охлаждения воды. 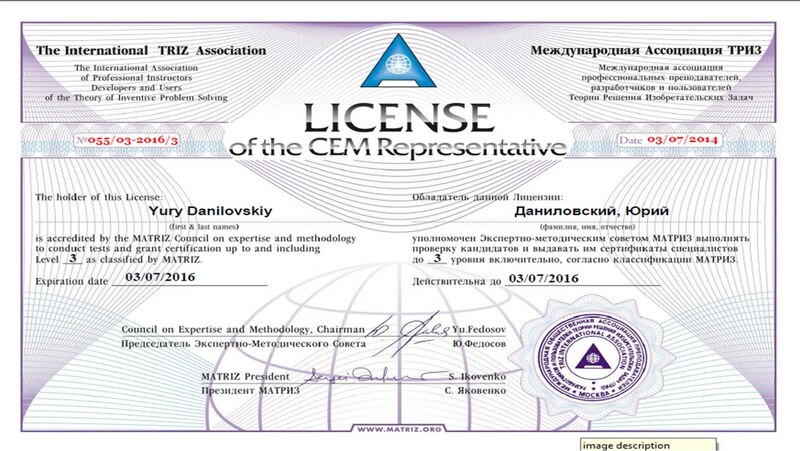 обход патентов по гастроскопу японской компании «Олимпус» и другие темы …. задачах с помощью софта GB TRIZ pro . – аналог IWB ( Новый Колумбийский опыт) типовые темы - повышение количества продаж систем бухгалтерского учёта для магазинов 24 часа, создание системы сертификации автомобильных покрышек – административные проблемы, Министерство науки Колумбии COLCIENCIAS (theNationalScienceandTechnologyAgency) – система оценки эффективности сотрудников для продвижения их по карьерной лестнице. Преподавательская работа – 2002-по настоящее время обучил практическому использованию ТРИЗ более 80ти групп с предоставлением услуги сертификации МАТРИЗ на разные уровни в ТРИЗ от 1 ого до 3его в России , Корее, Китае, Таиланде и Колумбии Пример: софтверная компания LG CNS ( клиент), цитата из их рекомендательного письма: Especially, Yougot 6.91scoreoutof 7.00. It is very high score in our class! 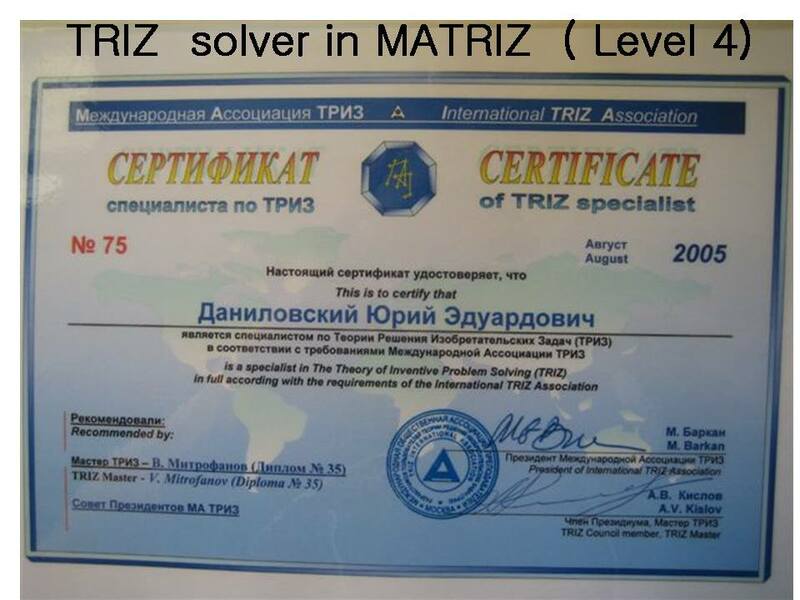 Our attendees said that your skill and passion was very impressive and useful to enhance their way of innovative thinking and understanding of various problem solving skills .полностьюhttp://triz-solver.com/index.php/o-sajte/227-teacing-of-yury-danilovsky,. 如：LG CNS培训班，推荐信片段节选“Especially, You got 6.91score out of 7.00. It is very high score in our class! 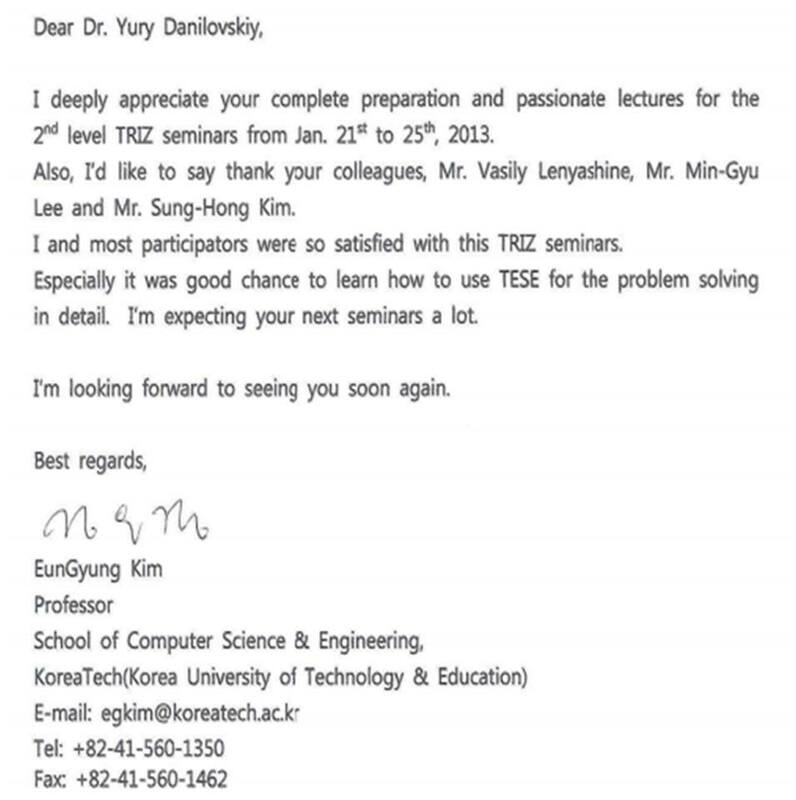 Our attendees said that your skill and passion was very impressive and useful to enhance their way of innovative thinking and understanding of various problem solving skills .”。详情见http://triz-solver.com/index.php/o-sajte/227-teacing-of-yury-danilovsky,. 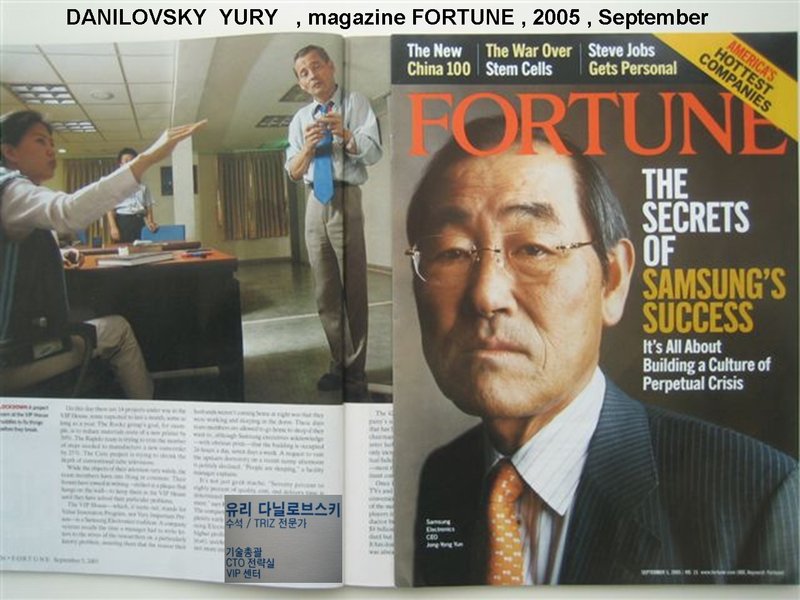 Gen3 Korea Innovation Consulting, Ltd.
More than 70 inventor’s certificates of the USSR, patents of Russia and Korea have been obtained. Full list can be found here. 50 scientific articles in the field of fire extinguishing. 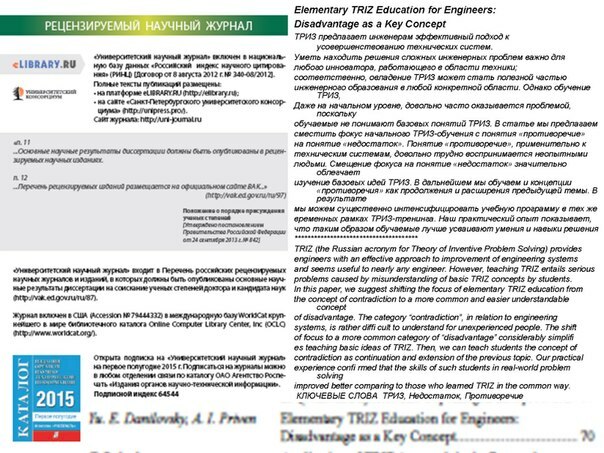 One book in Russian and one book (TRIZ manual for level 1) in Korean have been published, as well as 38 articles on topics, which are associated with the trends in development of engineering and with forecasting of technologies development. 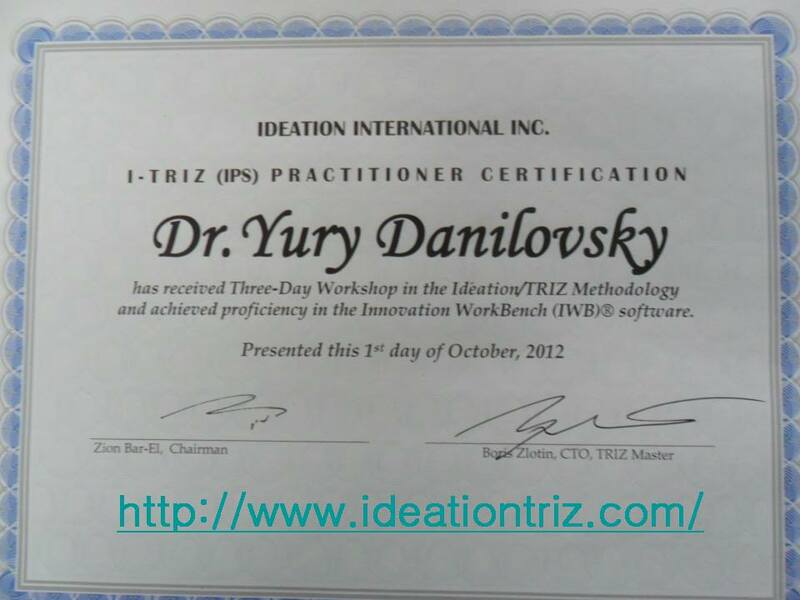 Perfectly masters TRIZ software The Innovation WorkBench® 2005 (IWB) and has a certificate and a license to teach this software in the universities. More than 200 inventive projects have been performed in the following fields: fire extinguishing, removal of fire gases, air purification and regeneration, sensors of mercury vapors, sensors of various gases, vacuum cleaners, conditioners, washing machines, conveyor systems, sources of light for computers, non-destructive testing of car pistons, measuring of pressure in automobile tires, rehabilitation of patients after apoplectic attacks, decorative lighting for landscape design (more than 130 projects in 5 years). manufacturing of nano-particles for diagnostics of cancer diseases, ultrasound liposuction of fat deposits, circumvention of patents relating to gastroscope of Japanese company “Olympus”, device for home growing of the Lactuca lettuce, sputtering technologies -- spraying of molybdenum coating over the polyethylene film, problem of dyeing glasses for mobile phones and of drying such glasses, manufacturing of reinforced glass (gorilla glass), utilization of food wastes, non-destructive testing of electric contacts in boards of PCB for braking systems of automobiles ABC, electronic piano -- development of new engineering solutions of keyboard mechanism and control over sound level, medical robots offering services to old people (the problem of ageing society), forecast of evolution of solar cell batteries, new areas of application of electric conducting polyethylene film, 8 projects for Shin Han Bank, powder dyeing of dielectrics and other topics. Search for new, heretofore unknown trends in the evolution of engineering. Influence of market tendencies upon engineering systems. 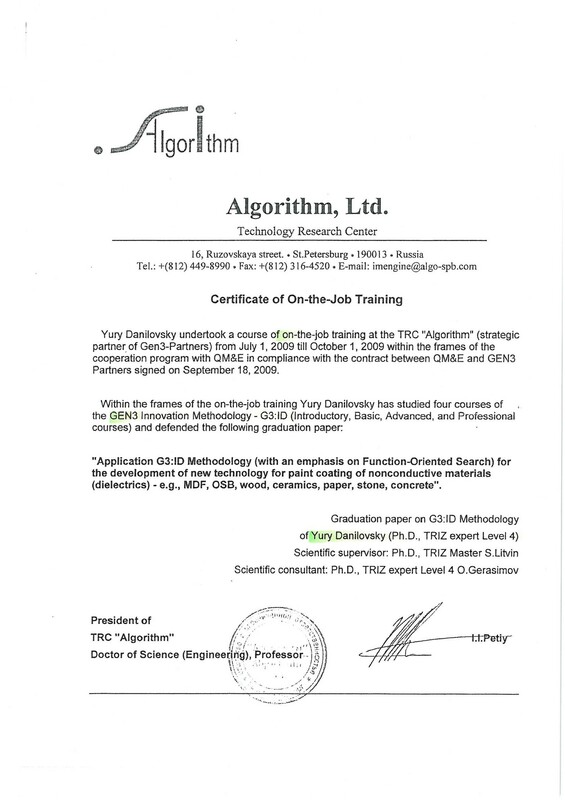 Methodology of search for new areas of application of existing technology. 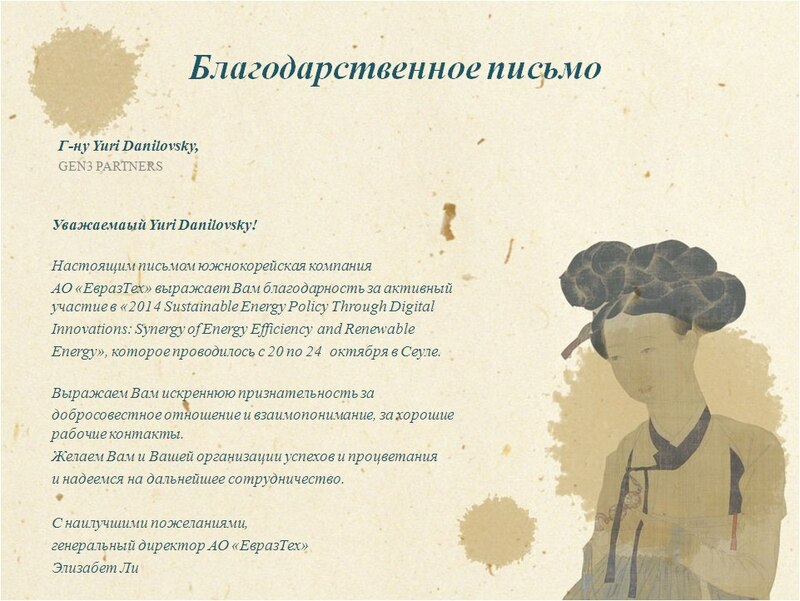 A seminar has been prepared. Окончил Ленинградский государственный университет имени А.А.Жданова, физический факультет в 1985 году. Получено более 70ти авторских свидетельств СССР, патентов России и Кореи. Полный список скачать. 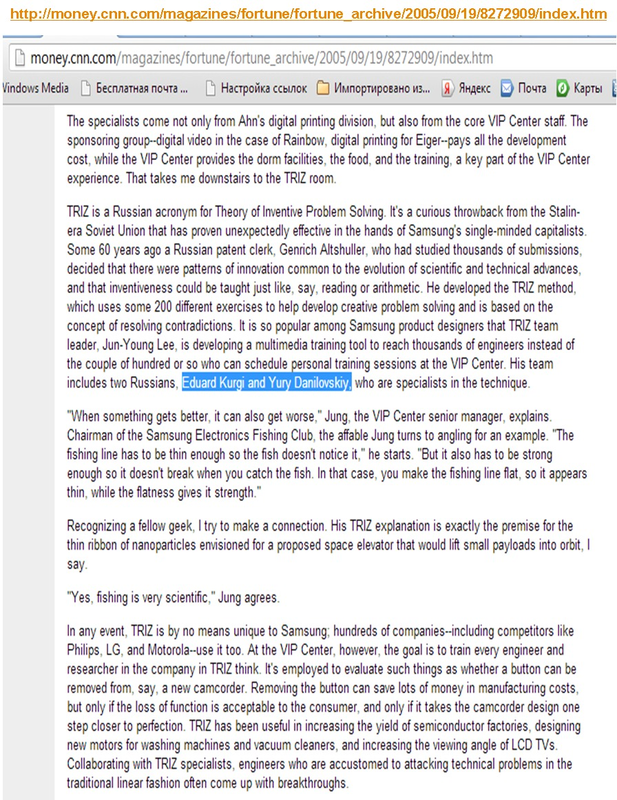 Свободно владеет ТРИЗ софтом The Innovation WorkBench® 2005 (IWB) и имеет сертификат и разрешение на преподавание этого софта в университетах. 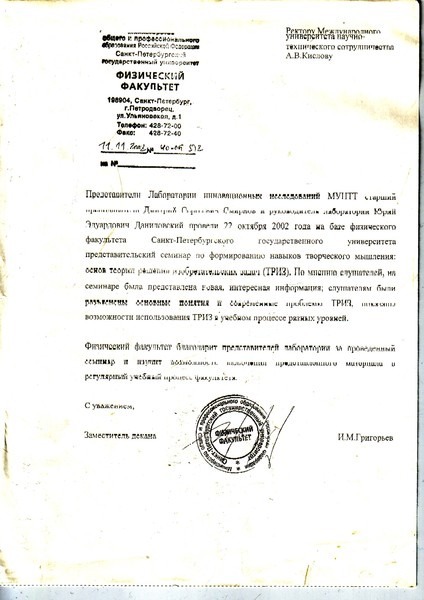 Провёл с 2001ого года 178 семинаров (лекций) по темам, связанным с закономерностями развития техники, прогнозированием развития рынков и конструкций систем, снижения себестоимости продукции ФСА (Функционально Стоимостный Анализ). Проведено 18 ТРИЗ- консультаций в форме коучингов с инженерами и сотрудниками R&D. Сделано более 200 изобретательских проектов в областях системы пожаротушения, системы удаления пожарных газов, системы очистки и регенерации воздуха, сенсоры на пары ртути, на различные газы, пылесосы, кондиционеры, стиральные машины, конвейерные системы, источники света для компьютеров, системы дефектоскопии автомобильных поршней, системы измерения давления в шинах автомобилей, системы реабилитации пациентов после инсульта ( 5 проектов), системы декоративной подсветки для ландшафтного дизайна (более 130 проектов за 5 лет). Система производства ферримагнитных нано частиц для диагностики раковых заболеваний, система ультразвуковой липосакции жировых отложений, обход патентов по гастроскопу японской компании «Олимпус», проектирование установки для домашнего выращивания салата латук, sputtering технологии – напыление молибдена на полиэтиленовую плёнку, проблема окраски стёкол для мобильных телефонов, проблемы сушки стёкол для мобильных телефонов, проблема производства упрочнённого стекла gorillaglass, система утилизации пищевых отходов, система дефектоскопии электрических контактов в платах PCB для системы торможения автомобилей ABC. Электронное фортепиано – разработка новых технических решений клавишного механизма и контроля уровня звука, медицинские роботы для обслуживания пожилых людей ( проблема стареющего общества), прогноз развития солнечных батарей, новые области применения электропроводящей полиэтиленовой плёнки, 8 проектов для ShinHanBank, порошковая окраска диэлектриков и другие темы. Поиски новых, ранее не известных закономерностей в развитии техники. Влияние рыночных тенденций на технические системы. Методика измерения и снижения рисков инновации на рынке. Методика прямых измерений идеальности систем. Подготовлен семинар по материалам 5ти проектов. Методика поисков новых областей применения существующей технологии. 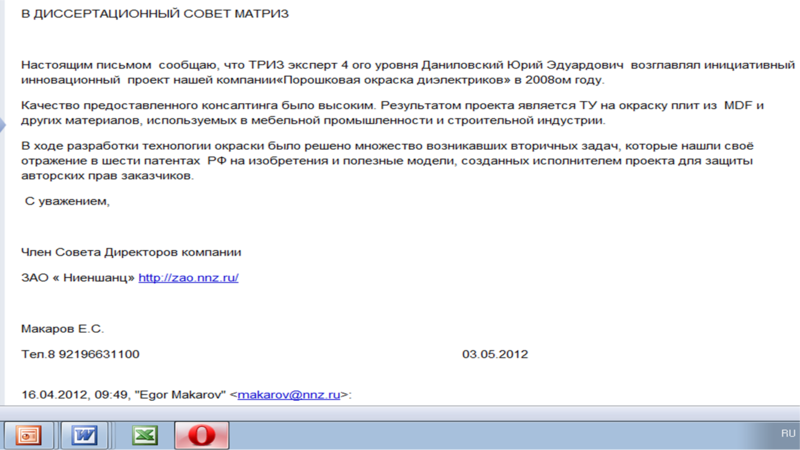 Подготовлен семинар.